Well, after an intense period of acquisition of PDA and various kinds of hybrid devices; things are getting back to normal : more quiet and more conservative. I've received two new BASIC pocket computers today, which is as conservative as can be, considering this is the kind of machine i've begun my collection with. Even better, one of the 2 machines i've received today is a PB-1000C; that's another version of the PB-1000 which was actually my first pocket computer. So, well, getting a PB-1000C is a typical collector's move : as in i'll get any variation of the device i can find. As a matter of fact, the only PB machine to come after the PB-1000 was the PB-2000, which changed the case to a much more regular one-piece case, dropped the touch-screen. So only 2 machines had that foldable, touch-screen casing, the PB-1000 and the PB-1000C. The difference between the two (apart from the yellow "C" itself, that is!) is that the PB-1000C replaced the built-in Assembly language by a "CASM" compiler/interpreter. So, well, now i've gathered the only 2 representative of the PB-1000 family, along with their dedicated MD-100 disk-drive unit. So well, maybe i'll open to ancient Sharp machines a little more in the future. In the meantime, the PC-G850V i've just received is most likely the most recent Sharp pocket computer ever produced. I should check for sure, but i think this one represents, along with the Casio Z1-GR, the end of a breed that lasted up until the late 90's in Japan, while significantly fading everywhere else in the world, replaced by graphing calculators. 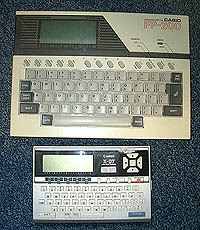 The PC-G850V offers C programming. I'll have to check and see whether BASIC is still there; and which other features are present (like maybe a program library? ), but i expect to find a graphing mode, as i may suspect from the "Graphic" mention just above the screen. This computer is also one of a kind, in the way that it offers a 6 lines display whereas just every other pocket computers have maximum 4. On such machines, 2 more lines means 50% more data onscreen, that's meaningful. Apart from those 2 machines, i've also received a few more "Japan only organisers"! These are not machine i'll display in my "official" collection; but they'll be the masterpiece of an "off" collection of good old organisers. I'm also waiting for a rare Casio machine of the kind; as my 3 other are currently only Sharp. Last thing for today, i've recently updated my collection pages, and most machines now have at least a presentation picture. I should be able to complete the descriptions more efficiently now that most pages are there, ready to have contents written. I'm very ashamed of myself : i've received word weeks ago from Evan Koblentz about his "Evolution of the PDA" treatise, and i mention it only now. The treatise is the result of a 4 years investigation on the origin of the PDA market and technologies; based on the simple question "which was the first PDA ever?". Turns out that this simple question is not one, but many questions in one. What is a PDA in the first place? If the "PDA" concept is defined by several main ideas, which machines first introduced those ideas? Which one first gathered all of them? Many surprising answers are given in Evan's great work, it is available here. Definitely a must-read for everyone interested in portable/pocket computers and their modern (and future!) applications. I've begun slowly updating my collection page, putting online a few pictures for a few machines that did not have one. 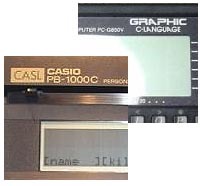 Namely, i've created pages for the Casio FX-890P, Casio AI-1000, Data Rover 840, Epson RC-20 and Panasonic JT-S10. As of now, i've only put images online in these pages, hoping to complete with descriptions and tech details soon. While i was at it, i've just received another parcel with 4 machines insides. Details on the contents : a Casio Z1-GR pocket computer, two Sony DD devices and one Sharp organiser. The Casio Z1-GR is, as far as i know, the most advanced, and maybe even the last, of the Basic pocket computer breed. Offering C, assembly and CASM along with the usual BASIC language, the Z1-GR is an evolution of the FX-890P. The Sharp organiser is a cute device, designed for the japanese market only; that will be presented in my "organisers" page to come. As i've mentionned earlier, i've discovered about this kind of machines just recently, and i just love the design. The interesting news in this parcel is the two Sony devices! The "DD" lineup stands for "Data Discman"; and i've just received two of them, among which the DD-1, which is logically named as the first of it's kind. So what IS a Data Discman in the first place? 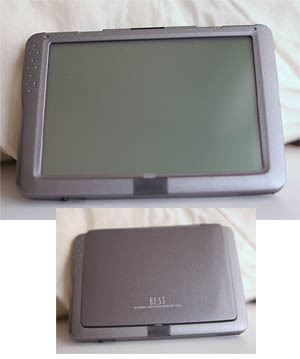 As of 1991 when the DD-1 was launched, it was Sony's vision of an electronic book. I'm just too tired to say much more about those right now, but i'll try to test them soon and write a small update, if not a dedicated page. >> Friday, June 10th 2005 update - Jingle bells, jingle bells! Sometimes Christmas day comes in June, well at least it just happenned to me today! As i was expecting 4 parcels to get to me within the next days/weeks, turned out that two of them arrived just this morning! While i'm at it, i should also mention the donation i've received a few weeks ago from Hideki Adam, who donated a Casio PB-100 and an FP interface; and who is also willing to send me another machine. Many thanks for the donations, and for the friendly e-mails! Now i also have to thank Niclas Nielsen, for sending me two great machines, and offering precious help and support! The Epson RC-20 was something i would have *NEVER* thought i'd ever find, until he told me that, well, he just found two of those, so he had an extra one to share! :) This excellent little machine is a touch-screen watch, Z-80 compatible, BASIC programmable watch! The icing on the cake is that it comes with an english manual; although the machine was apparently never distributed outside Japan! It's definitely one of the greatest addition to the watch sub-section of my collection! Niclas also sent me a Data Rover 840; it's a japanese machine from an obscure (at least to me!) manufacturer. The device runs Magic-Cap 3.1, as i've learned from this page and includes an old fashion web browser, so it means i'll certainly have great fun surfing the net with this great piece of retro-futuristic technology! The other machine i've received today is the Panasonic JT-S10. I really don't know much about it, like which OS it runs on, and if it's even working in the first place. It's still a very interesting set : it is a touch-screen PDA that comes in a leather casing with a bundled printer. I should put pictures of all these devices online soon; even better yet i should build their dedicated pages as well. I've also received in the packages a couple of good old "electronic organisers". Thing is, i'm actually beginning to have a significant number of them! Furthermore, browsing japanese online auctions, i've discovered something totally new to me : the japan-market-only PDAs! They mostly differ from your average organisers because of their japanese-specific keyboards (and software, of course), but also seem to have widely adopted a vertical form-factor whichever the manufacturer. 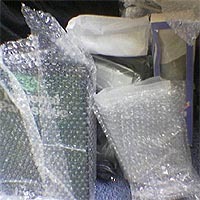 >> Wednesday, April 27th 2005 update - Casio FP-200 secured! Unwrapping an interesting chain of internet-born events, i've just received this morning a Casio FP-200 equiped with a Floppy drive and Three RAM modules! As of writting this, i have only opened the box and taken the FP-200 out of it yet, so i do not know exactly what else is in the box (manuals, documentations...). Still it's a highly interesting piece, and i'm particularly happy to get a floppy drive with it. On the right is the FP-200, above, next the Canon XO7, for size comparison. Back when the machine was released, it was seen as a competitor to the Canon XO-7 (as stated in this page (in French), and that's also the way i saw it. As my newly-acquired FP-200 is the first one i see for real, my first impression was that it's really huge and certainly much bigger than the XO-7. This may seem unsignificant today, but at the time, the computer market was very different than what we know in the early 2000s. At the time, there were basically 3 computers family : home computers, professionnal computers, and pocket computers. The machines that we know today as Laptops were still to invent, since portable professionnal computers were "transportable rather than portable" to quote many analysts. The world famous Osborne computers (the FP-200 and this one are from the same year) were then pioneering the market. - from the professionnal world : pre-programmed ROM modules or built-in applications; - several expansion such as floppy drives, printers... were available as options, thus also keeping initial cost and size factor low while providing advanced features for those who needed them. So, well, now that i clearly compare these 2 machines, i think they are not actually as similar as i thought and as i've read here and there. Anyway, even if this machine is not exactly a pocket computers, it deserves it's place in my collection, not only for being a Casio machine (yeah, i like Casio, as it shows by the number of Casio devices in my collection!). Call it early laptop, call it supersized pocket computer, it offers BASIC and computing power on the go, which is more than enough to fit my collection! Now i just have to update the collection list, then my wanted page; and finally, someday, add a FP-200 dedicated page. No new page or new machine announced in today's update. However, i've received great news from a fellow collector in Greece (among which one of the greatest news is certainly that he was not affected by the fires that occured in Athens last summer :)), and there were hints that i may get new items soon; maybe a couple of rare ones too. Anyway, there are still a few items in my collection that do not have their dedicated pages on the site. One of these devices is the Ricoh i-700 digital camera; which is, in many respects, an unusual piece among my collection. The thing is, Kodak just recently released the "EasyShare one" 4 MPixel digital camera and this new devices boasts quite a number of similarities to the earlier Ricoh camera. The easyShare one has a two-axis swivel sensitive screen and offers wireless network connectivity (although it's not clear to me whether WiFi is built-in or requires an extension card). 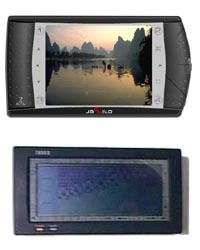 Approximately 7 years earlier, the Ricoh i-700 introduced a two-axis swivel sensitive screen and focused on data exchange, with a built-set of internet connectivity software and a PC-Card port. The ricoh was then a 3 Mpix camera and targetted the corporate market. It seems that it's pretty much the exact same recipe (enhanced and spiced-up 21st century flavor) that Kodak is now serving to the consumer market. That 2 way swivel screen idea apparently comes from the camcorder's world; and i'm guessing Ricoh was the first manufacturer to introduce it in a device closer to the pocket computer's world. Following manufacturers were Sony and Sharp for their respective Cli� and Zaurus products; in a move that resembles HP's 1995 pioneer attempt of a dual mode keyboard/tablet transformable PDA There's logic in finding this feature back on imaging devices today (as in the Casio P-505 that also come even closer to the camcorder world). Discussing a bit with Evan Koblentz, from the Computer Collector Newsletter, we agreed that the PDA market, as mature as it is (even so mature that it's now declining, but that's another story), has never produced anything that would stand appart as being close to perfect. I personally think that the whole swivel screen thing (or one might consider it swivel keyboard for that matter) is a good idea, and should definitely be a starting point to define what a perfect device should be, combining a large display and a comfortable keyboard as well as offering a way to get rid of the keyboard when it's unnecessary. But it's a good clue as of which conceptual oppositions PDAs have to face. The perfect machine should actually be two machines in one : perfect in data input, and perfect in data browsing. In my opinion, that's what the whole swivel screen is about. One could say that if a perfect PDA seems like a holy Grail never to be reached, it's because user's expectations keep evolving along with technologies. That's just partially true. When designing a computer user interface (UI) where a user needs to interact with several elements, like files, there are basically only two different approaches to how the interaction will be sequenced. Think of a Word file that you want to open : you can either select the file and open it (by double clicking it for instance); or you can run Word, then select the "file/open" option, then select the file. I call the former sequence the "object to action" method; whereas the latter is the "action to object" approach. Now, i like to map these approaches to PDA design, as a PDA is basically a device that is used to store data and interact with them. I think of PDAs as either "Features to data" oriented or "Data to Features" oriented. The "Features to data" breed gathers the machines that come loaded with lots of appealling useful features. They basically also come with the immediate need of feeding them something accurate to actually use all of the features. Despite this kind of device was a more pregnant reality in the 80's (when they were called "organisers"), i'll explain why i think winCE is still representative of this trend. I date the origin of the "Data to features" family back to the first Palm Pilot release. The Palm Pilot introduced the simple idea of PC-Synchronisation; which made all the difference. It was a PDA that was an extension of all the personal data that were already available on a PC. Data browsing was the key (and database was the software architecture key), and Graffiti made complementary data input simple, in a compact form (as opposed to a keyboard) and in a reliable way (as opposed to previous handwritting recognition systems that had a long way to go to reliability). The PDA market is now declining, but a new handheld market is growing and reaching a much larger audience than traditionnal PDAs : this market is represented by smartphones, digital cameras and MP3 players. Personally, i've stopped using a PDA the minute when i was able to store my contact list in my mobile phone. Find a contact; make a phone call, as easy as it gets, all in a single device, data (contact) to feature (call). I've recently read a page where a user explained the benefits of her new cellphone : "i can take pictures of an event and instantly send them by e-mails to my friends to share the moment; i can also read my e-mails, engage in MSN chats...". I think this is what "convergence" is all about. This word now sounds pretty dated, and may remind us of such attempts as digital cameras with built-in MP3 players. Now, how silly is that? Why should my digital camera play MP3s? Well, as Apple would say : think differently. Take the number one hard-disk based MP3-player in the world, and add it a color screen and a photo browser. Well i was not convinced at first... Now, bring an optionnal "digital camera connector" (basically a USB host extension), to make your player able to download pictures directly from just any digital camera, with up to 60GB of memory, litterally backup hundreds of memory cards that you'll be able to carry along. What's the OS inside the iPod? No user can tell, and as far as most of them are concerned, no one actually cares. The data is here (my music, my pictures...), Apple just offers the features to properly enjoy/manipulate them on the go. "Your life, to go", an advertising baseline made true from the iBook to the iPod. Now i understand much better what Steve Jobs said when introducing the Apple Photo : "there's no market for video features; since there's no contents yet". What he meant was not *only* that the iTunes store does not offer paying video content yet. What he meant was also this : the market for Personal video players is a geeky market, and personal digital video contents are already portable in digicams, there is no need as of just now for a video playback feature that hardly a few ones will ever use. The iPod also offers a few built-in PIM (Personal Information Management, features that were once the core of organisers and PDAs software. Need i say more? My point is not that the iPod is actually Apple's re-entry in the world of PDAs. I do think, however, that there's a clever move going on from Apple to both create and fill the market of personal-use PDA that come undercover. It also makes it obvious that succeeding in the portable electronics consumer market does not require any reference to the existing computer world. There is thus plenty of room left for other products, like business products and many more. There also; data must be the design goal to keep in mind. WinCE once over-ruled Palm OS mostly by announcing more CPU power, more colors, more features, and *also* PC compatibility. I think the lots of available features made it clear to a number of users (not to mention quite a number of corporate buyers) that there was no point to this. Ok, well, i have a 600MHz processor, a digital video player and a plentyful of software, i've paid extra money for it. Now what? As things go on, the WinCE model now has to choose between fading away to let more and more compact full-featured portable/tablet PCs do the job; or offer a more humble face, based on user-friendliness, simplicity and existing data. Microsoft of course understands it, and now offers solutions to compete with such systems as data-oriented Blackberry and Sidekick. WinCE is also aimed at smaller, more integrated devices like cellphones, and also made it's way into a few gaming systems or digital cameras. I've read quite a few pages on the web about the iPod camera connector after i've realized how interesting and meaningful this small option was. These readings encourages me thinking it actually *is* meaningful, and that's what i've been trying to explain in this column. Now, back to my very own self, i definitely think this iPod USB host thing marks a change in how i see pocket computing devices. There has been a long period of time (that all winCE/Palm war) when i almost lost all interest in what was going on. I may have lost sight of what was *actually* going on, or most likely i got bored at how long the whole thing lasted. Thing is, with a few rare machines i'm still waiting to add to my collection, i'm feeling my collection is also taking a turn. What will be it's new direction, if any, is not clear to me yet. Well maybe it's also the time for me to take a rest from searching and start working on a few other projects around my collection, like completing the missing pages or working on pocket-computer history. >> Tuesday, March 17th 2005 update - A french PDA!! I got news yesterday about a not-so-new project that started a buzz as early as july 2004 : the Jackito PDA (upper right). Why i've heard about it only now is beyond me, since the news was apparently widely conveyed in many sites i use to visit. Anyway, the fun fact is that i've actually worked 10 years ago in the company that designed the device!! I thus think i can be positive about one thing : the machine exists. I actually own one of the early prototype, the Index (pictured above, 2nd machine below the Jackito) for which i've created this presentation page. I sure would love to add a Jackito to my collection, if it was not for the price of the thing... At a $600 pricetag, there's no way i'd buy it just to get a new unusual piece. Why would this PDA be so unusual? Well, mostly because it's french! Next because it really stands apart most state-of-the-art PDAs. It's a totally different approach from the war for processing power and multimedia features. I leave it to you to find detailled information on the official Jackito website. I must say i'm very surprised and quite pleased to discover that this machine is finally brought to the market, and it brings me back many memories! Now, what more could i say about the machine is not clear, as i've signed a non-disclosure agreement that maybe is not expired yet. I should check if i can! The Ricoh RDC i-700 is a machine i've been interested in for years, since i've first seen an unreadable (in japanese, that is...) page about it years ago. Basically a 3 mega pixels digital camera, the i-700 include several features that make it very worth entering my collection. First interesting feature : the i-700 offers a sensitive screen and a stylus controlled interface. Sensitive screen actually is a feature that would almost make a device eligible to my collection all by itself! Anyway, the i-700 has even more to offer than just a fancy user interface. On the hardware side, the i-700 also provides a PC-Card interface; and the last special hardware/casing feature i'll mention here is the swivel screen that offers 2 different configurations. Now, add built-in software that makes good use of all this hardware and you'll have what Ricoh has named an "image capturing device". It is actually a very interesting effort on what an evolved digital camera can be : using the touch-screen, it is not only possible to navigate the menus, but also to directly draw on the screen, comment images, add notes, and store user-modified images in memory. Adding a communication card in the PC-Card port, built-in internet features include an e-mail client, FTP software as well as a web editing tool! Well, at the end, i think that the machine is actually really close to a PDA. Strictly speaking, most digital cameras hardware would be powerful enough to support PDA software (as a matter of fact, there has already been ports of various open-source projects such as games on earlier Kodak digital cameras). Adding a touch screen, internet abilities, a PC-Card port and a dual-modes swivel screen makes the RDC i-700 actually closer to the PDA world. That's why i've always been interested in this machine ever since i first sw it. Thanks to a new internet miracle, i've been able to get one of these babies! It just arrived this morning, i've been able to switch it on once (only to get a japanese warning message i'm unable to understand!) but nothing more yet. Here's one machine i have to take off my "wanted" page! >> Wednesday, September 15th 2004 update - Sharp Color Zaurus added! Continuing my "buying in Japan" craze, i've recently received a Sharp Color Zaurus! This one is yet-another-machine-i-thought-i'd-never-get, so, again, Internet is the best thing! On the right is a part of a Color Zaurus screenshot. As you may notice, it's in color. As the machine was released in 1996, it is very likely the *first* color screen PDA ever. You can get more information about the device on the specific page i've created for it here. This is the 51st device that enters my collection! My, the days seem very long ago when i just own 3 machines that i actually used almost everyday, and i did not even know they where the first ones of a collection! As i have now gathered many of those machines that i thought i'd never have, i must say that i do not feel the same about collecting more machines. There are still a few additions i'd like to make (check my wishlist to know more! ), but i'm not quite as excited about acquiring new machines as i was before. I've started changing all my topic home pages to a weblog format months ago, yet this very part, despite being one of the most visited one in my site still did not get it's new look. This is now corrected! This part is actually still missing a few more updates, as several machines i own in my pocket computers collection do not have their dedicated pages yet. However, the reason for updating the site today is that i recently got 2 more nice additions to my collection! The Seiko Ruputer and the Casio WMP-1 MP3 reader watch have both joined the list today as i received them yesterday. The former is a "PC compatible" wristwatch, and the latter is quite obviously an MP3 reader disguised as a wristwatch. These are interesting pieces i was looking for for quite some time, without actively chasing them, tho, as they are still common. As an example of this, i'm now waiting for an EO-440 PDA, one of the first communicator system of 90's fame, which has just been shipped to me yesterday from the USA. This machine was actually quite rare until there was a wave of them on sale in a 2 months period lately. I'm looking forward to get this toy, that i've listed in my pocket museum section as one of the most interesting PDA experiments of the 90's. After all that, what else could i expect more? Well, surfing the web i realize there are still newer potential acquisitions i'll keep an eye on, after all :). On the pocket computer part, i've also been asked twice this year to provide expertise about pocket computers for court cases. That's interesting, and a very interesting reward for my collecting and for this website. Future projects for this part include building a complete-as-can-be history of pocket computers and PDA; which would be a more comprehensive version of the current museum. However, i think i should complete the missing pages before working on this.